Do Some Schools Have a Disproportionate Share of Students Living In Homeless Shelters or Doubled Up in Another Household? About 75,000 students—or over 7 percent—of the city’s 1.1 million public school students lived in the city’s homeless shelter system or were doubled up in the home of a friend or family member at some point during school year 2013-2014. A disproportionately large share of temporarily housed students were concentrated in a relatively small number of city schools. 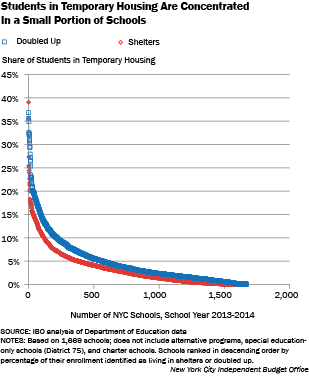 About four hundred schools (close to 25 percent of the total 1,669 schools examined) served a population where at least 5 percent of students enrolled were identified as living in shelters and at least 7 percent of students were identified as living in doubled-up housing during all or part of school year 2013-2014. One hundred and twenty schools served a population where more than 10 percent of students were identified as living in shelters; there were 12 schools in which more than 20 percent of students were identified as living in shelters. Two hundred and eighteen schools served a population where more than 10 percent of students were identified as living in doubled-up housing. There were 34 schools in which more than 20 percent of enrollment was identified as living doubled up. More than 560 schools, or roughly 34 percent, have less than 1 percent of their student population living in a shelter. Nearly 280 schools have virtually no students identified as living in doubled-up housing. Analysis of student data from 2013-2014 shows that students living at least part of the school year in homeless shelters were absent from school far more frequently—about 18 days more—than their permanently housed peers as well as those who were doubled up. Students who resided in homeless shelters were suspended from school at more than twice the rate of students who lived in permanent housing. State test scores for 3rd through 8th graders were also significantly lower for both students living in homeless shelters and those in doubled-up housing situations compared with their permanently housed peers.